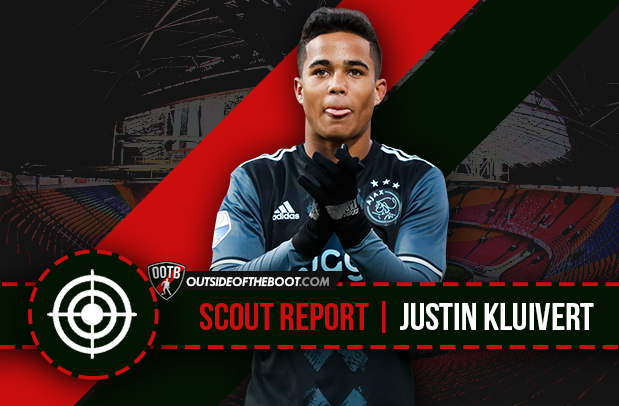 Danny Lewis provides a comprehensive scout report on the Ajax’s tricky young winger, Justin Kluivert. Many Ajax supporters feel that this is the most exciting crop of players their club has had for years. With a still ongoing run in the Europa League and a plethora of young talent coming through it is easy to see why. Kasper Dolberg, Matthijs de Ligt and Davinson Sanchez have all had highly successful debut seasons with the Ajax first team. Another one who is thriving at the Amsterdam ArenA is right winger Justin Kluivert, who has broken onto the scene rapidly. He has already played a key role in big games for Ajax, with an example being the assist that he provided Davy Klaassen for his second goal against Schalke 04 in the first leg of their Europa League quarter final tie. Amin Younes has secured the starting place on the left wing for Ajax, but the same position on the right hand side is still up for grabs. David Neres has staked a claim for that position along with Václav Černy, while Bertrand Traore sometimes plays there when Dolberg is deployed in the centre forward role. However, if Kluivert continues to show his early promise, he could be making that position his own at the tender age of 18. Justin Kluivert was born in Amsterdam on 5th May 1999 and is the son of Ajax and Barcelona legend Patrick Kluivert, but the youngster is already showing that he deserves to be considered on his own merit. The winger has represented Netherlands at youth level, from Under 15s all the way through to the Under 18s whom he currently plays for. Kluivert scored two in five for the U15s and three in 10 for the U16s, but hasn’t managed to get on the score sheet for the U17s or U18s. It’s been an incredible rise for the teenager, as it was only on 16th September 2016 that he made his debut for Jong Ajax, coming on for the last 20 minutes of a 1-0 loss to MVV Maastricht. He got his first goal and assist for Jong Ajax in his second start, which came during a 3-1 victory over SC Cambuur in the Dutch Jupiler League on 2nd December 2016. He then really started to catch the eye when he repeated that feat by getting another goal and assist in a 4-2 win over Helmond Sport. After just five games and one day short of four months after his Jong Ajax debut, Justin Kluivert got his debut outing for the first team. He managed 51 minutes, coming on for the injured Amin Younes against PEC Zwolle. He then went on to score his first goal for Ajax, securing his team a point in a 1-1 draw against FC Groningen on 5th March 2017. He has come on leaps and bounds and is now constantly battling for a place in the starting XI. The youngster has come out and said that he wants to follow in his father’s footsteps and represent Barcelona. He has big ambitions and if he continues to develop at the rate he has been there’s no reason why they can’t be fulfilled. Justin Kluivert is 5 foot 7 inches and is very pacey with a low centre of gravity and great agility. He uses this alongside his quick feet and close control to run at defenders and beat them. In the mould of any great Ajax winger, he is very direct in the way that he attacks the opposition full back and is a constant threat. When the ball is with the opposite winger, Kluivert comes off of the wing to get in at the back post and has profited from that, as this tactic earned him his first goal for Ajax. Kluivert’s strengths come into play when he has the ball at his feet. His close dribbling mixed with the aforementioned physical attributes allow him to twist and turn to get away from full backs. Once he has an inch of space Kluivert is able to squeeze through it with the ball still at his feet to get away from the full back and closer to the opposition goal. He is very good at linking up with team mates using short, quick and accurate passes and has an 82% pass success rate in the Eredivisie this season according to WhoScored. Quick one-twos executed well not only bring his team mates into play, but also gives a decoy which allows him to get in behind the full back with ease. Some young wingers tend to neglect the defensive side of the game, but Kluivert works very hard to get up and down the pitch. He is capable of putting in a good challenge and when he has played in big occasions, such as that Schalke tie, he has shown a maturity to get back and double up on the winger with the full back to help out his team. He can be a little bit lightweight which can see him pushed off the ball at times by stronger players. However, he is still only 18 so he can work on this over time and will naturally get stronger with age, but he already finds ways round that by using his trickery and agility. One thing Kluivert does have to improve on is his end product. The youngster currently has one goal and two assists for Ajax, which is something he needs to improve upon if he is to continue to keep challenging for the starting spot in Ajax’s team. It is clear that he is capable of this, as he got two goals and three assists for Jong Ajax and one goal and five assists in the UEFA Youth League this season and it could simply be a case of him adapting to the step up in opposition. He could need time to fully establish himself, but at the age of 18 time is something he has plenty of. Kluivert has a brilliant skill set, which has clearly been honed over the years by the Ajax academy, which has given him the tools to become what could be one of the top wingers in Europe. There are many players in this young Ajax contingent who could be looking to play for one of the giants of European football by the end of their career and Justin Kluivert is certainly one of them.